It was 7 o’ clock in the morning. I had been walking for over three hours and was exhausted. Okay, that’s par for the course for long-distance hiking. But now there were two new elements in the equation. I was short of breath. Not surprising considering I was at over 17,000 feet and still climbing. And secondly, I had a headache the likes of which hopefully few mortals experience. Altitude mountain sickness had set in. The lack of oxygen and dehydration cause humans to lose some of their faculties at elevations over 17,000 feet. In a sense you are making a break for it at that elevation. Finally, after trying breaks, throwing down even more altitude pills, and chugging water relentlessly, I reached Thorung La Pass at 17,800 feet. I was jubilant. Better yet, trekkers on the Annapurna Circuit–after walking nothing but uphill for nine straight days–are greeted with a 5,200 foot descent. It was one of the greatest ‘glides’ in my life and I almost gloried in my pounding, wobbly headache in the early morning sun. 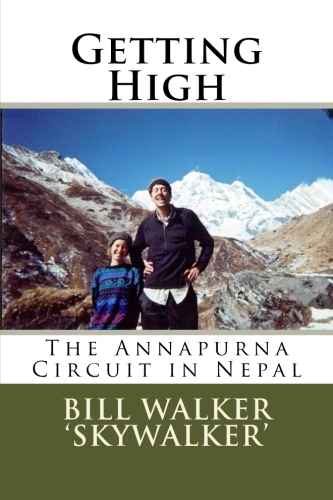 Bill Walker is the author of several hiking books including Getting High–The Annapurna Circuit in Nepal. He is also the author of Skywalker–Close Encounters on the Appalachian Trail, Skywalker–Highs and Lows on the Pacific Crest Trail, The Best Way–El Camino de Santiago, and Tall Tales–The Great Talisman of Height.